Researchers from the University of California, Berkeley have developed a lensless camera that produces 3D images from a single 2D image without scanning. The image sensor has a diffuser (a bumpy piece of plastic) on top of it instead of a lens and so they call it DiffuserCam. The hardware may sound simple but the software that comes with it is actually very complicated. Download full text here. According to the researchers, the camera is initially meant to monitor a microscopic neuron activity in living mice without the need of a microscope. Eventually, the technology can also be applied in the future for several other technologies that require capturing 3D information. 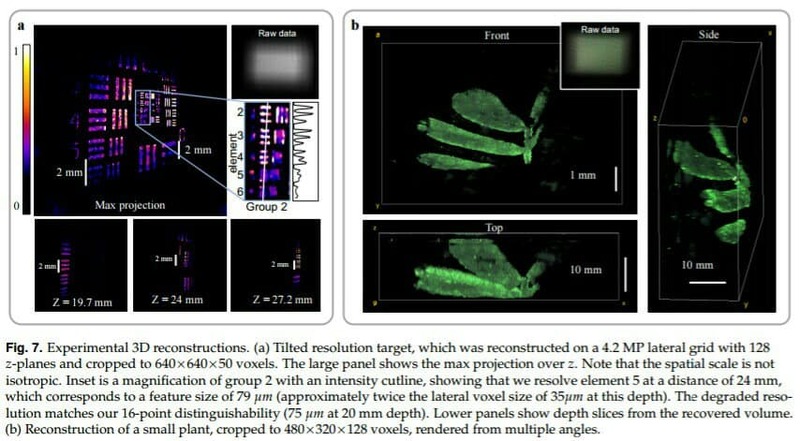 Researchers had recently demonstrated the ability of the DiffuserCam to reconstruct 3D pixels from a 1.3-megapixel image of leaves from a small plant without them having to scan it 360°. The DiffuserCam is also very inexpensive to build as it only requires image sensor and a diffuser. The image sensor can be of any type of image sensor and the software might soon be available for everyone, giving masses a freedom to utilize the technology. The DiffuserCam can capture objects ranging from microscopic all the way up the size of the human. The resolution is said to be decreasing depending on how far the subject from the image sensor, however, it is still be very high enough to distinguish which is the closest or the farthest object from the sensor. This new type of camera is somehow related to light field cameras. Light field cameras capture how much light is striking a certain pixel on the image sensor as well as from which angle the light hits that pixel. For the light field cameras to work, it needs an array of tiny lenses placed in front of an image sensor to capture directions of the incoming light. This would allow the software to recognize objects in three dimensional form, allowing the user to refocus the subject. One of the major drawbacks of light field cameras is that the microlens arrays it uses are expensive to produce as it has to be customized for a particular camera. The quality is also not that great because some spatial information is lost in favor of collecting directional information. 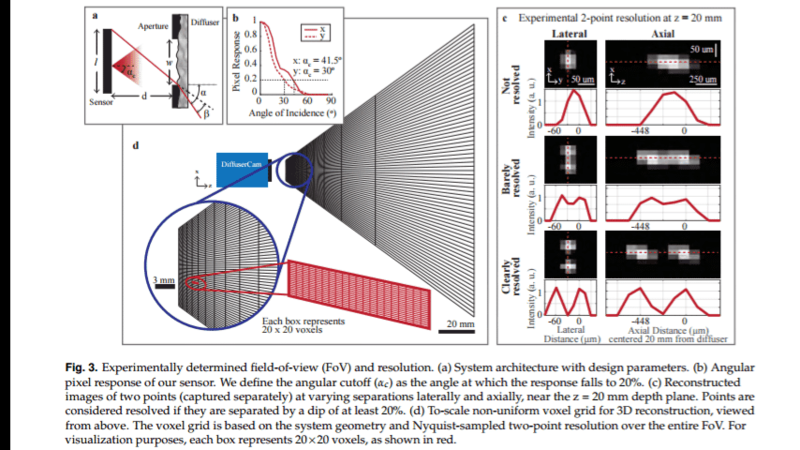 It took the researchers many experimentation with various types of diffusers and a lot of time to developed the complex software algorithms before they discovered that Waller’s idea for a simple light field camera was actually doable. Phys.org reported that using random bumps in privacy glass stickers, Scotch tape or plastic conference badge holders, the researchers were able to improved the traditional light field camera capabilities by using compressed sensing to avoid the typical loss of resolution that comes with microlens arrays.